This immensely satisfying novel, like life, is full of surprises, following the path of one man from conception to old age, full of highs and lows, witty banter, and moments of angst. I enjoyed every minute, and I want to spend more time with Cyril and company. It's nothing like The Goldfinch plot-wise; nonetheless, it was the first comparison that came to mind. My favorite book fo 2017! This is hands down my favorite book of the year. Boyne has written a story that is heartbreaking, rage inducing, and often laugh-out-loud hilarious. The story covers 70 years in the life of one unforgettable Cyril Avery whose life mirrors the development of Ireland from near-medieval Catholic clergy control to the modern, more accepting country it is today. Characters you will love, characters you will hate, all of them will rattle around in your head for months, if not longer. Cyril Avery is not a real Avery -- or at least, that's what his adoptive parents tell him. And he never will be. But if he isn't a real Avery, then who is he? Born out of wedlock to a teenage girl cast out from her rural Irish community and adopted by a well-to-do if eccentric Dublin couple via the intervention of a hunchbacked Redemptorist nun, Cyril is adrift in the world, anchored only tenuously by his heartfelt friendship with the infinitely more glamourous and dangerous Julian Woodbead. At the mercy of fortune and coincidence, he will spend a lifetime coming to know himself and where he came from - and over his many years, will struggle to discover an identity, a home, a country, and much more. In this, Boyne's most transcendent work to date, we are shown the story of Ireland from the 1940s to today through the eyes of one ordinary man. 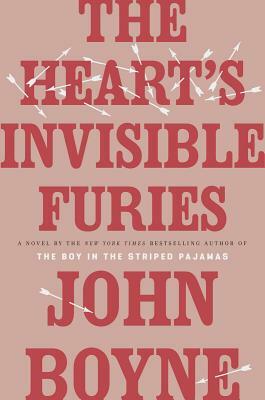 The Heart's Invisible Furies is a novel to make you laugh and cry while reminding us all of the redemptive power of the human spirit. JOHN BOYNE is the author of 10 novels for adults, 5 for younger readers and a collection of short stories. His 2006 novel THE BOY IN THE STRIPED PAJAMAS was an international bestseller, selling over 7 million copies worldwide and being made into a film, a play, a ballet and an opera. In his native Ireland, he has won three Irish Book Awards and been shortlisted on 10 separate occasions. He has also won or been shortlisted for a host of international literary awards, including a Stonewall Honor Award and a Lambda Literary Award in the United States. A regular participant in internationl literary festivals, he has also been a member of the jury for the International IMPAC Dublin Literary Award and, in 2015, chaired the jury for Canada’s Scotiabank Giller Prize. His novels are published in over 50 languages. "Bleak, bittersweet, and Irish to the bone... explore[s] the relationship between Catholicism and patriarchy in midcentury Ireland and beyond." "With intricate narrative precision, The Heart’s Invisible Furies cuts to the heart of what family is, how it is chosen, and how it endures. And it is charming and funny, even as it dives down from the precipice of endearing humor into the very specific ironies and cruelties of real life…. characters are cinematically rendered, with a deft, decadent wit that will make you laugh aloud at least once. Searing heartbreak; loneliness; a quest for internal and external redemption, solace, and contentment are all there in The Heart’s Invisible Furies." “More than a coming-of-age story, The Heart’s Invisible Furies is one man’s journey from persecution to toleration….The novel… delights."